As students unwrap plastic coverings from freshly purchased textbooks and get into the swing of another semester, it’s also time to mark calendars with some exciting events. 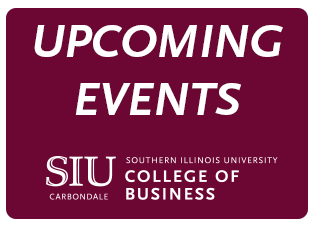 The Office of Diversity and Inclusion (ODI) and the Business Placement Center (BPC) have planned seminars, workshops and events to ensure that students do well at SIU and beyond. The first noteworthy event is the ODI’s Operation Impact Workshop happening Jan. 31. This seminar focuses on how to be a successful student. Its inspiration came from the realization that some students are still struggling with the transition to college life. Manifestations of this issue include taking on too many social activities, not studying enough and not knowing who to reach out to when help is needed. This seminar will help as it covers topics including time management and email etiquette, how to properly take notes and creating effective resumes. A guest from SIU’s Student Health Service will also be available to discuss common challenges students face such as stress, and what resources are available to them at SIU. Jazlyn Stanciel, a graduate assistant at the ODI, spoke about this event’s value to students and what the ODI hopes to do this semester. “This is the 2018 kickoff. Our focus is on preparing students and helping them transform what they learn here into tangible skills they can take with them to the real world,” she said. Another ODI event to note is the Black Business Expo on Feb. 23. Held during Black History Month, the expo serves as a celebration and showcase of successful black business owners. ODI staff have reached out to Carbondale black small business people and will offer them space to showcase their businesses and speak to students. The ODI will host a women-centric event, the “Empowher” Networking Lunch-In on April 23. It will feature a panel of female leaders from the community discussing topics relevant to women working in a professional settings, including navigating the workforce, pay and sexual harassment. During the lunch, students will be seated with successful professional females so they may discuss their experiences and receive advice. “This semester our office has done more planning. We have more events are working hard so that students know we care about them individually and that it is our mission to see them be successful,” Stanciel added. Also working toward this goal is the Business Placement Center. The center is kicking off the semester with another “BPC After Dark” event on Feb. 19. The office will stay open until 8:00 p.m. so students can get their resumes critiqued and check out clothes from the Career Closet prior to the career fair on Feb. 20 and Marketing U on Feb. 22. The BPC is also sponsoring its first Chicago Career Trip March 29-30. During this weekend trip students will have the opportunity to meet with representatives from two of four participating companies; depending on what their major is. There will be two companies for marketing and management students and two companies for finance and accounting students. Participants will leave Thursday morning, enjoy a provided lunch finish the day in the city at a reception with business professionals, SIU alumni and prospective students. They will spend the night in a hotel and then visit companies on Friday. Payton Hilton, a management senior and student worker for the BPC advises all students to take advantage of this opportunity and offers some words of advice for younger business students who may be hesitant to sign up for an event like this. “If you’re a freshman this kind of event will gives you a good idea of what the work-life balance is like at these companies and where you could be in a couple of years. It’s good to know if you could picture yourself working at these kinds of companies,” she said. Also worth mentioning are events the Department of Marketing and Phi Beta Lambda are planning to expose students to even more professional development opportunities. Marketing U on Feb. 22 will function as a day-long, College of Business-specific conference with seminars on topics including entrepreneurship, retirement and negotiating a salary. Phi Beta Lambda has seminars lined up throughout the semester to expose students to some relevant topics such as networking, investing and mastering LinkedIn. “The workshops are free and open to any student at SIU,” Marissa Fergus, president of this registered student organization, said. “We would like to give students learning opportunities for skills they can’t learn in the classroom, but will definitely need to know before they head out into the workplace,” she said. The College of Business is kicking off the new year with wonderful, student-focused events. Be sure to follow the college on Facebook, Twitter, and Instagram for the updated event postings and important news to know.